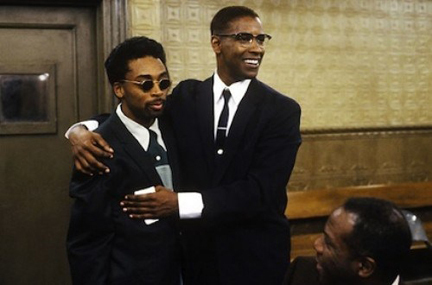 Twenty years ago, Spike Lee made movie history. His epic biopic of the controversial and complex Malcolm X became a cultural touchstone, made Denzel Washington an A-list superstar and cemented his status as a true auteur to be reckoned with. Yet the film’s path to the big screen was far from smooth and the movie’s eventual success was anything but guaranteed. Hollywood had sought to adapt Malcolm X’s story since not long after his assassination in 1965. Legendary author James Baldwin even wrote a draft of the screenplay in 1968. But the subject matter and political climate during the ensuing decades prevented a Malcolm X movie from being made. Eventually Norman Jewison, who directed one of Sidney Poitier’s greatest films, In the Heat of the Night, was tapped to helm Malcolm X’s story. Rising star Denzel Washington, who co-starred in Jewison’s A Soldier’s Story, was cast in the lead. Although Jewison was a highly-respected, socially conscious filmmaker, there was widespread concern about a white director bringing the life of a black nationalist to the big screen. After a loud, growing chorus, led by Spike Lee, called for his removal from the project, Jewison stepped aside. “If Norman actually thought he could do it, he would have really fought me. But he bowed out gracefully,” Lee said. Yet Lee, no stranger to controversy himself, was also a polarizing choice for some. An anti-Spike Lee rally was even held in Harlem led by black radical poet Amiri Baraka. “We will not let Malcolm X’s life be trashed to make middle-class Negroes sleep easier,” said Baraka. Although Washington had portrayed Malcolm in an off-Broadway production to considerable critical acclaim, there were many who objected to him winning the big screen role because of his lack of resemblance to the real-life icon. “In real life, Washington, who is about 6 feet tall and the color of mocha, bears little resemblance to the reddish-brown, 6-foot-4-inch Malcolm — a fact that has not gone unnoticed by many who knew the Muslim leader,” the New York Times reported in 1992. It turns out complaints about the director and star were the least of the production’s problems. Lee sought to make a truly epic film in the style of the previous year’s JFK or David Lean’s Lawrence of Arabia. This meant a 3-hour plus running time, elaborate period sets and international location shooting — which would include footage from the holy sites in Mecca. However Warner Brothers, the studio financing the movie, was only willing to commit to a budget of roughly $30 million. When Lee began to go over budget there was a legitimate threat that creditors would shut the entire production down. “The budget that we had for Malcolm X… everybody knew it was not adequate. We knew it, the bond company knew it. And Warner Brothers knew it,” Lee said during an appearance on Inside the Actor’s Studio. Desperate, Lee sought out a who’s who of black America’s rich and famous to donate funds to save Malcolm X. Bill Cosby, Janet Jackson, Oprah Winfrey and Prince are just a few of the illustrious names who kept the film afloat. “I called Magic [Johnson], he wrote a check. Then I called Michael Jordan, told him how much Magic gave,” quipped Lee. With the movie now solvent again, Lee was able to complete the film as he saw fit and it hit theaters on November 18, 1992. The movie performed solidly at the box office, earning $48 million domestically, and scored widespread critical acclaim. Ebert would name it the best film of the year and one of the best films of the 1990s.